Create segments of your active users who have similar credentials or who display similar in-app behavior with Swrve’s real-time segmentation feature. It makes your analytic data more meaningful by enabling you to measure, compare and act on data for specific user groups. It enables you to target specific users in your push notifications, in-app messages, Conversations campaigns, and resource A/B tests. Swrve does not collect information that identifies individual app users nor does Swrve passively collect information of any kind. All information must be sent to Swrve explicitly using the Swrve API. 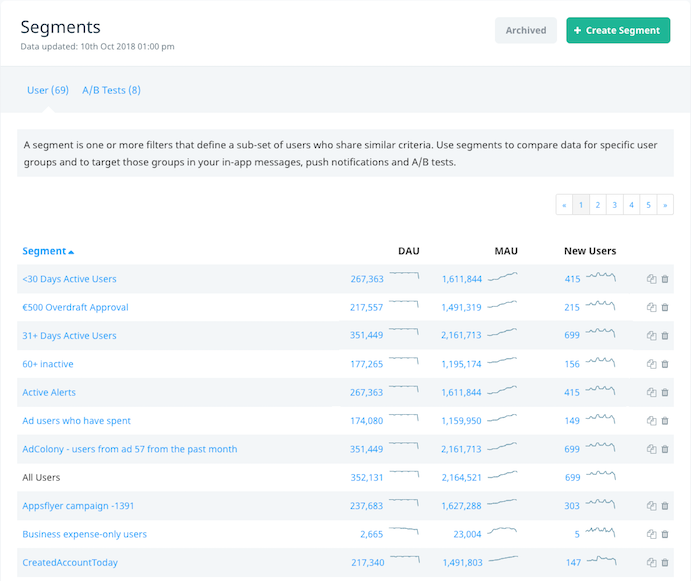 Segmentation makes analytics more meaningful—you can view and analyze key performance indicators for particular user groups to compare their behavior over time, measure success and identify potential targets for future personalized campaigns. Swrve reports such as the Trend Reports, Items Chart, User Attributes and Events are available for all users, but they also enable you to single out the data for a specific segment of users so that you can study those users in greater detail. Swrve remembers the most recent segment selection that you have applied on each Swrve screen. This enables you to move between reports to study the behavior of a specific segment without having to reselect the segment each time. Segmentation enables you to create highly personalized campaigns; for example, you can target all non-spenders using an in-app messaging campaign promoting a discount on all purchases. Or you can tempt nervous buyers (buyers who have visited your store a number of times but haven’t made a purchase) with a push notification reminding them about a particular time-limited offer. After you create the segments you want to use in your in-app message, conversations and push notification campaigns, manually select the required segments during message creation. Swrve automatically creates segments for resource A/B tests. In this manner Swrve provides insight into the behavior of users who have chosen one variant of an A/B test over another. Segments begin collecting data from the time they are created. Segments are not retroactive. For example, if you launch your app on the 1st of the month, but create a segment for high spenders on the 5th, the data from the 1st to the 4th is not included in that segment. Manually via the Create Segment screen. Automatically by Swrve for each variant in a resource A/B test. If selected (during completion of the in-app message or Conversations workflow) to track the audience that engaged with the campaign. If selected (during completion of the push notification workflow) to track the audience who opened your app by accepting a push notification. The Segments screen provides an overview of all your segments. The Segment Details screen provides a detailed view of a particular segment. To view the Segments screen, on the Manage menu, select Segments. DAU – the number of daily active users. MAU – the number of monthly active users. New Users – the number of new users since the previous day. A miniature representation of the KPI graph is displayed to the right of each KPI value to illustrate trends for the segment and KPI in question over the past month. Create a new segment. For more information, see Creating segments. Select a KPI value to display the segment and KPI on the Trend Reports screen; this enables you to compare KPI values for the segment over time. For more information about the Trend Reports screen, see Trend Reports. Access the Segment Details screen (on which you can view and rename an existing segment) by selecting the segment name. Create a copy of an existing segment by selecting the duplicate icon to the right of the segment. Swrve creates a copy of your segment which you can then edit and save as a new segment. Delete an existing segment by selecting the delete icon to the right of the segment. View archived segments by selecting the Archived link. A/B test segments are automatically archived if the A/B test for which they were created is archived. To view the Segment Details screen for a particular segment, select the segment name. To rename a segment, select the Edit icon next to the segment name, enter the new value, and select Save Segment. Deleting a segment results in the loss of all historic analytic data associated with that segment unless and until a full app history re-roll is performed by Swrve for your app. Events are not lost, but analytic data that was calculated in the past for your app no longer exists for that deleted segment. For newly-created segments with minimal historic data, this is rarely an issue. However, for segments which have existed for months and are key reference points for the app’s prior performance, exercise caution when deleting a segment and its associated history. View segmentation best practices before you create a new segment. For more information, see Segmentation best practices. Create a new user segment. For more information, see Creating segments.